Innovation: the lifeblood of video games. The state of the medium has been shaped by the legendary game changers of their day. Entire genres have shifted, and some even created, thanks to the new ideas that have spawned over time. In these days, the big innovation rush has mostly left the Triple-A side, as the need for returns and the formulaic approach drives stagnation. That has opened the door for indie titles to truly push the boundaries of gaming. 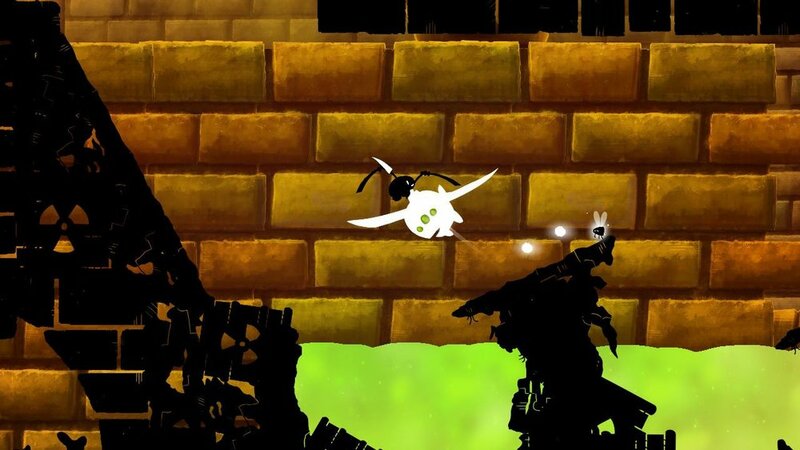 Platformers is a genre that has been ripe with innovation, which we can also see in Shadow Bug. The way you move around each zone in Shadow Bug is where the game differentiates itself. Instead of jumping, you use homing attacks on enemies to leap around. Your little ninja bug will sail towards the targeted foe, slicing them into pieces with ease, and putting you in the position to get around. These attacks can go through walls and obstacles, with no chance of failure. This allows for unique level designs that utilize the feature perfectly. Spikes, dangerous liquids and a myriad of different foes stand as barriers to completion, and breaking them down is fun and fast. The start of Shadow Bug is slow and easy, allowing you to get used to the nature of the mechanics. Eventually the difficulty curve kicks in, and the game begins throwing more persistent hindrances at you. Shadow Bug offers two styles of controls to utilize its unique system - touch screen and motion. The touch controls emphasize the mobility of the Switch by having you touch where you want your little bug friend to go. The movement to left and right suffers, though, due to having to hold and cover part of the screen with your hands, but it allows for more chained, agile and precise attacks. The motion controls, leaning towards a docked or standing screen playstyle, has you point a little cursor around to aim attacks, while the stick controls your movement. This makes traversing the landscape more fluid, but the occasionally finicky nature of motion controls has its drawbacks. Targeting doesn’t have the same speed as the touch controls, and unexpected lag and unaligned sensors can cause a quick failure. You're able to center your cursor, something I found necessary to do quite frequently. Which style you choose ultimately comes down to your preferences. The levels have a very stylized look, full of dark shadows and silhouettes. Despite your little ninja bug being straight black and quite miniscule, the artistic design rarely has him disappear. This is thanks to the brighter backgrounds that make each adversary, hazard, and ledge or wall immediately noticeable. The overall tone has a dark, edgy vibe, with the juxtaposing color scheme of muted black foundations sitting in front of beautiful pastel backdrops with neon-colored threats. The build of each map is fairly small. Designed to be completed in a matter of minutes, they’re kept tight and action-packed. The more comfortable you get with the control scheme, the quicker your movements will get, and the game has a strong sense of timing built into it. Failure is also mitigated by quick respawn times on enemies, which allows you to immediately get back into the action after a flub. It's also used as an extra challenge frequently. Adding to the speed is a fast respawn of your character with generous checkpoints, making failure less of a detriment but gets you right back into the action. Combine all this with tribulations thrown at you, and your skills and reflexes are pushed to the test, without any discouraging play. For the completionists among us, each level has goals to meet. Completing the level, doing so in a set amount of time, and collecting small orbs will net you a shuriken tokens upon reaching the stage’s end. There’s no major benefit gameplaywise of completing these challenges and earning the shuriken symbols on each level, but it's a bonus for those looking to pad out the game and push their skills. The main levels of Shadow Bug are fun and can occasionally push you, but it’s the boss levels that truly test you. Starting off simple, these foes have the deck stacked in their favor and I found that they will kill you - a lot. The first few bosses drop you right into a direct fight, the strategy being to avoid their attacks while waiting for their weak spot to appear. 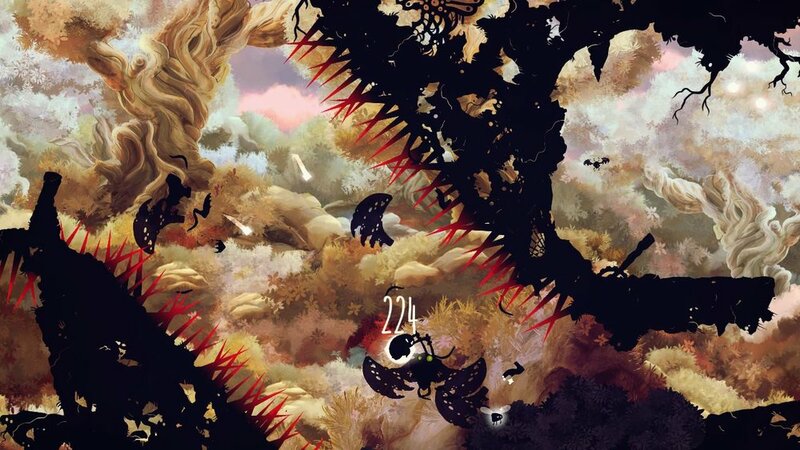 Later adversaries involve full levels to traverse, with difficult puzzles and high levels of timing required to get to their conclusion. As a reviewer, I found the break from the basic boss structure refreshing, but as a player, I found these segments difficult and frustrating. The biggest failure of the game, highlighted by the boss segments, is that the controls aren’t perfect. I used mostly the motion controls, and my biggest failures were due to the bugs inherent to that design. Whenever I switched to the touch-based controls, I found my dexterity in attacking to be seamless, but I was unable to properly move forward. Neither control scheme could adequately give me a foolproof system that would have made me feel completely in control. Despite that restriction, I found myself pleasantly surprised by Shadow Bug. The slow start is a bother, but the game quickly wins you back when it removes the training wheels. The speed of the gameplay never got away from me, and even with the bosses throwing up major hurdles, taking them down feels like a huge accomplishment. This is one game that I can perform my recommend-jutsu on! A journey isn’t complete without the adventure, and it’s the environment that shines brightest in Castle of Heart. Utilizing smart design choices, the land is traversed as a side-scroller platformer. You move the knight through the landscapes, jumping up and over obstacles both big and small. In sections such as sliding down roofs and leaping or ducking to avoid spikes, timing becomes often key. Other times hindrances, like giant logs of thorny death, require a diving roll to duck under. Thankfully, the story was around to carry me through. Broken in twine, Lost in Harmony features two campaigns that play equally in terms of gameplay. However these two tales are far from similar in terms to quality and detail, and it highlights what good writing brings to a game. The first thing you notice about Titan Quest is its similarity to Diablo. Keeping the God’s eye view point, you move around a bleak-looking world taking out mythical and religiously inspired enemies. The religion of choice here is Greek mythology, featuring satyrs, centaurs, harpies, and... more satyrs. By no means an unknown game, The World Ends With You: Final Remix was something I had always been intrigued by but was unable to find the time or chance to play it. Originally released on the Nintendo DS, this JRPG by Square Enix differs greatly from many of their better-known titles, and is heavily influenced by a Japanese youth culture. Something I vastly underestimated before jumping into Thea: The Awakening was how strong of a survival game it truly was. Masqueraded as strategy with a turn-based system, your goal is to last as long as you can with a group of villagers in a darkness-infested world.